Fruits galore! That’s the mantra behind this vibrant and tasteful mocktail. Healthy, eye-catching and bursts of freshness make the Fruity Burst a drink you won’t be able to resist. 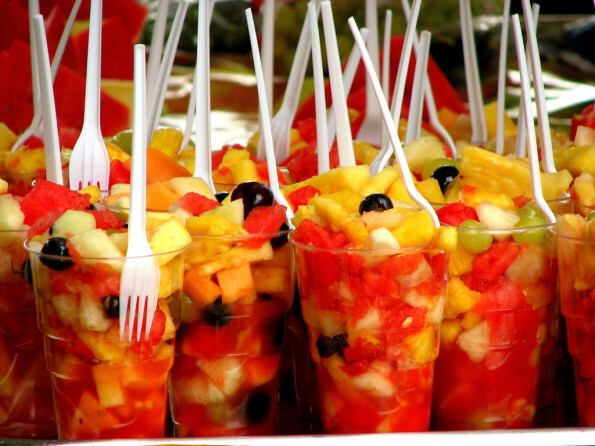 And the best part is, if you increase the quantity of fruits in it, it can turn into a welcome drink / appetizer as well. Perfect for kids and family get togethers. Put a small saucepan on medium heat with apple juice, lime juice, zest and cinnamon sticks in it. Also add in sugar if you like to make it extra sweet. Bring to a boil stirring occasionally then reduce heat to simmer for 5 to 6 minutes. Remove from heat, pick out and discard cinnamon sticks. Let it cool to room temperature. Peel and core fruits if you are using seeded fruits. Then chop them into bite size cubes. Combine all fruits in a large bowl and pour the cooled apple juice mixture over them, toss to coat all pieces well. Divide into serving bowls or short glasses and serve.